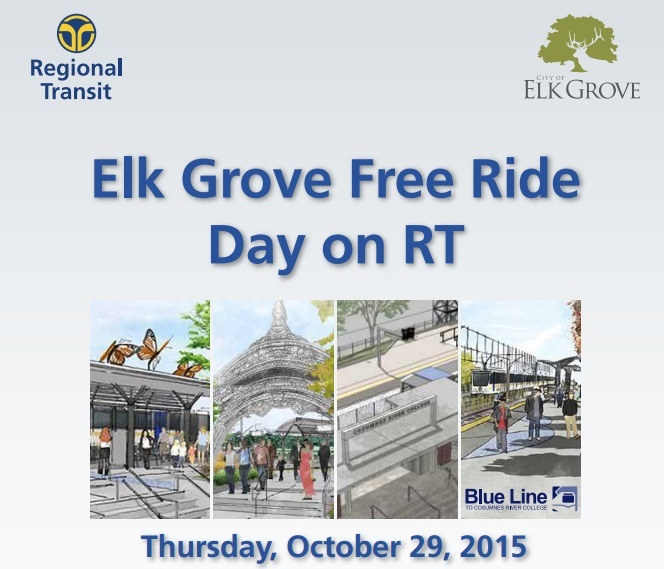 In an effort to build ridership and mend fences, Elk Grove residents have an opportunity to ride all Sacramento Regional Transit (RT) bus and light rails lines for free this Thursday. The free offer for Elk Grove residents comes as RT and the City of Elk Grove seek to build traffic on the Blue Line light rail line. The Blue Line was extended south and recently opened a new station at Cosumnes Community College. Elk Grove, which in the past was openly hostile to RT, has attempted to mend fences and behave in a more regional cooperative manner. Elk Grove is considering gutting their highly popular existing express commuter buses to Downtown Sacramento and route commuters to the Blue Line. By switching commuters to the Blue Line by cutting the commuter express routes, Elk Grove hopes to reduce their annual transit subsidy, mend fences with RT and switch funds to establish a more robust intra-city bus route system. The proposal to gut the commuter routes has proven very unpopular with users, many of whom are government employees. 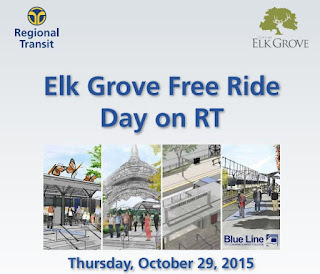 To ride the RT light rail or bus lines this Thursday, residents will need to show a valid photo identification with an Elk Grove address. For riders embarking at the Blue Line station at CRC, RT staff will be available for assistance. More information about RT light rail lines and the program is available here.